The first thing we did today was go to Lowe's and get more building supplies. The main things we purchased were. I really encourage anyone building a house or a bus to buy deals when you find them even if you are not going to use the item right away. Always look in the clearance sections. We found the roll of carpet sitting in the carpet clearance section where they put carpet that are miss cuts and returns. The price on it was already marked down to $18 for the roll. We offered them $6 and they said; "It's yours." The other day we were at Lowe's and they had a box of returned special order granite tile. The real stuff. Normal price was $45 for a box of 5 12x12 tiles. We got the box for $5. 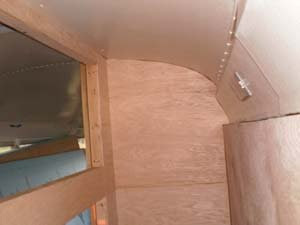 Also, as mentioned before in the blog, was the solid wood bi fold doors that will be taken apart and cut down to make the closet doors in the bus. They also where a special order item that had been returned to Lowe's. Original price was $160 we got them for $22. Deals are out there if you look for them. When we returned from the store we started working where we left off yesterday. 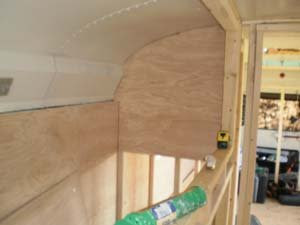 We had the main outside top support done so we did the bottom one. 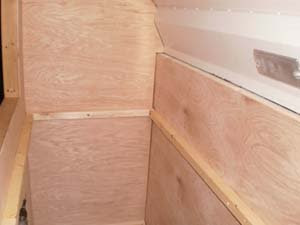 Before I could put the supports that will hold the plywood that will support the foam for the bed I had to get my paneling in. 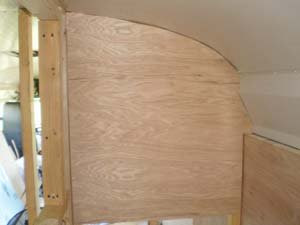 I had to figure out a way to make a pattern of the arch in the ceiling so my wood could follow the same contour. I cut a piece of cardboard the width required. Then I found a narrow piece of wood to use as a guide. I placed it against the ceiling and a pencil against the my wood guide and the cardboard. 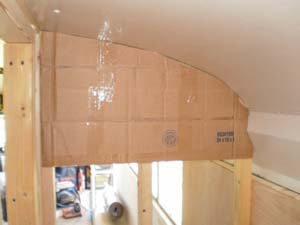 Now, making sure I was as plum as possible, I gradually moved the stick to the right, down the roof line tracing the same ceiling arch onto the cardboard. Once I had it done I cut the line with my utility knife. Here it is. 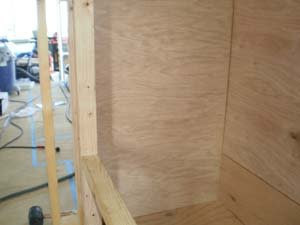 I then took a second piece of cardboard and filled in where the ledge is on the right side in the picture above. Now I had my pattern. I traced the pattern onto a piece of oak plywood and cut it out with a jigsaw. Here is the result. I then put in the piece that goes below it. I was able to use my pattern for the other side also. 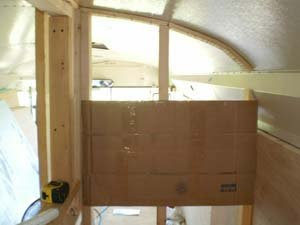 Now all the paneling on the inside of the bunk chamber is done. 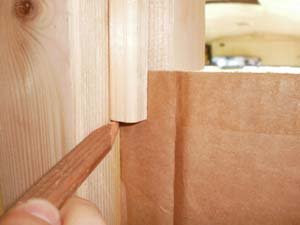 Next I installed the support strips that the ply wood will rest on. 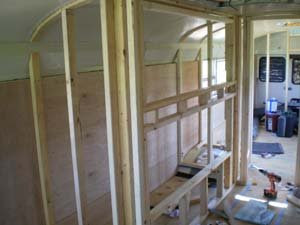 Tomorrow the bunks on this side of the bus should be finished. 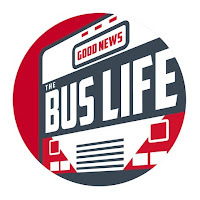 Love yalls bus! And the details you provide! 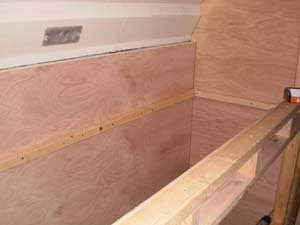 It has helped with our conversion process as well:) What were your bunk bed length and width measurements? I am thinking we will make ours a little smaller than standard twin, but wanted to check what other people did and how they liked it. Our bunk bed will be for two kids, but I would like it to be big enough so an adult could sleep ok in too. Thanks!